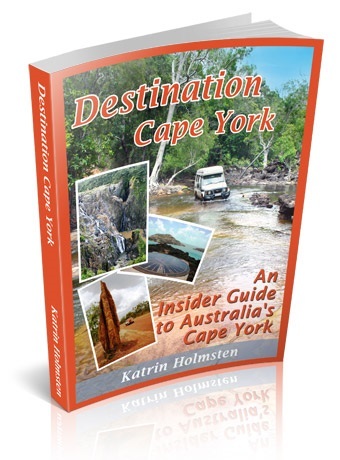 This complete, 300-pages Destination Cape York Travel Guide is all you ever need to successfully complete your trip and enjoy it. I do recommend you to read this page to the end, as there is much more in the Guide than this year's updates! TO CLAIM YOUR CHRISTMAS PRESENT PLEASE CLICK HERE! * Which rivers go up enough to cut the PDR and how to check them any time of the year? * Travel times on the peninsula vs travel distances. * Do you need to book accommodation and camping? * Peninsula's four wheel drive tracks list and map reviewed and tracks added. * Mobile phone reception reviewed - and the old payphones were added that can still be very handy in the remoteness where there is no reception! * The list of FREE campsites, and the ones on your way here from Brisbane, Sydney, Melbourne and NT, reviewed and updated as everything else in the guide. * Quarantine rules explained better with the Torres Strait included (this is in your interest as it protects the rest of Australia's agriculture more than Cape York). All of the above and lots more, added to the wealth of the information that is already in there. This year's research work was done in the northern Cape and Torres Strait (to those who don't know, each year there is a different area that gets done in more detail). Still, the southern locations were all reviewed line by line in the Guide and updated, places like Yarrabah, the new Cooktown waterfront and many more were added. In the north, tracks and places around Weipa, NPA such as Ussher and Sadd Point, got revisited and updated, festivals were added along with more detailed information. * the Old Telegraph Track got done in its full length in October 2018 and all new chicken tracks (that now pop up almost yearly) were added to the Destination Guide. It's as fresh information on the full track as you can get, in a written form that you can bring with you to your trip (each crossing explained one by one). * Torres Strait got revisited, improved and updated, including Turtle Head and other closer islands. * Thursday and Horn Island with more detail on places and Horn Island with new tracks added. * The question I get a lot - where to leave your vehicle on the mainland while you are on the islands - is answered in detail. * Friday Island lunch details - absolutely delicious and professionally made seafood that you will remember forever! * Outer Islands was this year's big trip in case that you missed the last newsletter. 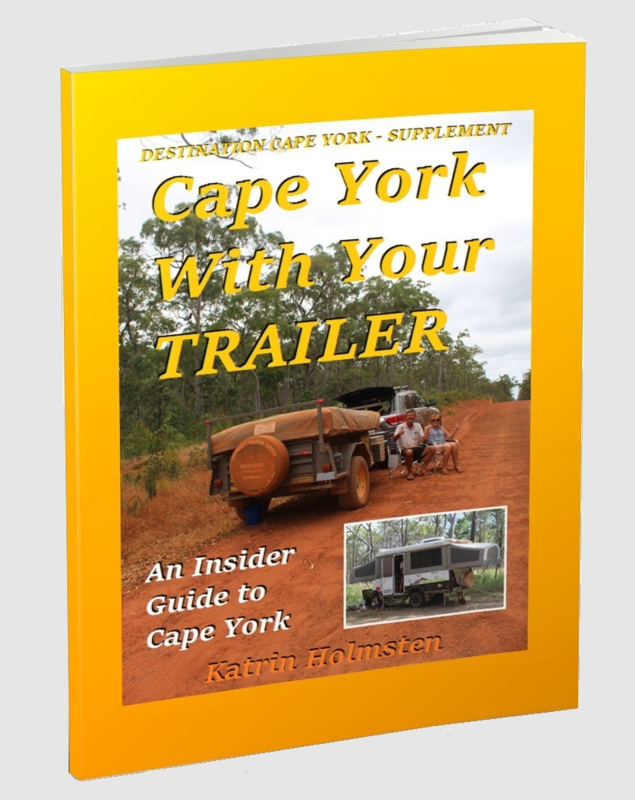 You will find this guide INVALUABLE for your Cape York trip. Why? There are a lot of things in Cape York that most people don't know about and they are not on this website. There are also a lot of things you don't know unless you are a LOCAL. It's most likely your ONLY trip you will ever do to Cape York - compared to the cost of your trip it is a VERY cheap way to make sure you got all you wanted out of it! And if you plan many - all the better - you've only got more time to make the most of it. Confused about a HARD COPY BOOK vs an E-BOOK and what kind is this guide? Must read! (opens in a new window so you keep this page open). * Full detail about what there is to see and do in each place, with maps; hints about why would you (not) include a place in your plan (everyone is different), and how long time you're likely to spend in the place. * Full detail about all the extra fun in each place - scenic flights, fishing trips, crocodile spotting tours (recommended to do on your way back if you didn't spot a wild one); and all the trips and tours to the Great Barrier Reef and Torres Strait Islands (including how to get to even the remotest ones). Prices, description of what each company offers, and full contact details. * Full detail about all the accommodation from top class to dongas with all the prices, addresses and contact details. Please note that Wiki Camps has no idea and I am not relying on them for a second. The local scene changes way too quickly for them! * FREE camping spots along the way TO Cape York from Brisbane, Sydney, Melbourne and Northern Territory. Much appreciated, and might I add your book was the best Cape York resource that I found. Well done. I would love to say thank you! Your guide book is by far the best on the market. I know that because I am a very accurate person, and I spent hours with planning my trip and get all the information sorted. Your book stands out between all the others and also the web information. We will tell other about your book and site - you provide the best information we have found. We would love a similar source for other regions. * Practical information about vehicle preparation. * Tips on what to bring. * How long is it between fuel stations - do you need jerry cans? * Should you stock up camping food? * Do you need to bring cash? * Where to check if a road is open? * Where to check the current weather and cyclones? * How to contact all the tourist info centres, national park rangers and indigenous councils? * How to contact that remote roadhouse or cattle station the contact details of which you just cannot find anywhere?? I have found the Guide invaluable in planning my trip. You have done a great job with it. I understand much more about it all now and feel much more informed to choose places to go. Your guide is not the first one I have read but it is by far the best. Love your guide and newsletter. Timely, full of essential information. Planning to come up to the Cape in late August. Regards from an avid follower. * Full contact details and opening hours of your closest pharmacy, medical centre, hospital and Royal Flying Doctor Service. * Full contact details and opening hours of your closest car mechanic and RACQ. * Full contact details and opening hours of your closest post office, bank, and info on what places do/not have EFTPOS facilities. * Full contact details and opening hours of your closest grocery shop, pub and bottle shop. * Full contact details and opening hours of your closest restaurant and food outlet. Even what they serve! Hi, just wanted to thank you for the website, guide book and newsletter. All are informative, fun and easy to read. Love the no bull approach. Please keep up the good work and may the wet be safe and as long or short as you would prefer. Thanks again. A lot of people don't know about your book, but those who have it are singing its praises. There's lots of information in it that just simply can't be found elsewhere. Thank you for your two wonderful books I have been madly reading. * How to safely cross creeks and rivers. * What you should check daily on your vehicle. * Tag along tour companies with prices and full contact details. * Remoteness, how it can be dangerous, and how to stay safe. * What dangerous animals are found in Cape York and how to stay safe. Why this Book by Me? I did not write this book about a corner of Australia that I visited. I wrote this book about the corner of Australia where I live. I have lived here since 2003 so the book, and this website, are written by a local. But I haven't always been a local here, I have lived down in Sydney, so I also know what questions you will have as a traveller. And I am originally from Europe, so I also know what questions you, international travellers have before you visit Cape York and the rest of Australia. I am obviously also a woman, something that has not been of any disadvantage! 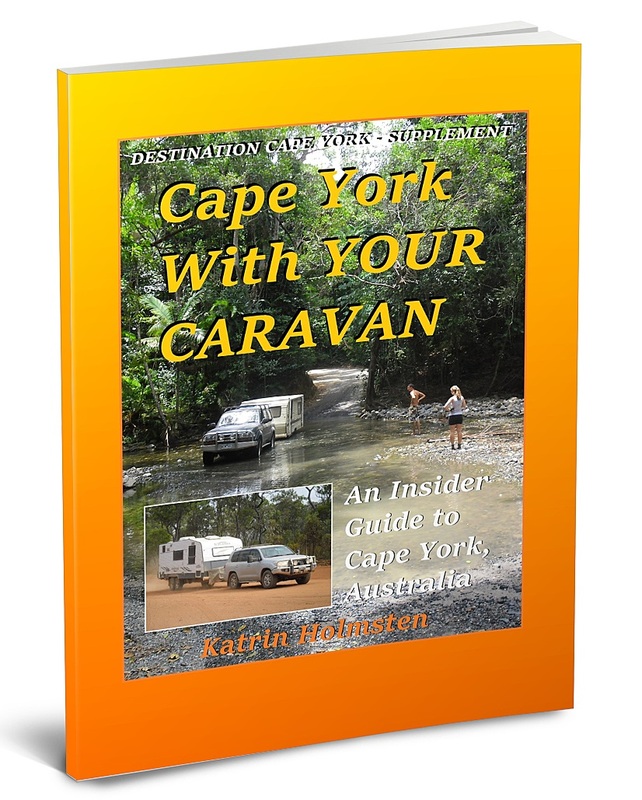 I did my first trip to Cape York on my own and with no four wheel drive experience. That means, I also know how you feel, and what you need to know if you are a total stranger to four wheel driving. * Quarantine rules that also apply to you as a traveller. * Aboriginal land alcohol restrictions and where exactly do they apply - there are tricky bits, yet you are responsible (and the penalties are up to $75,000 fine, 18 months' imprisonment, and confiscation of vehicle - not joking!). * In which places on Aboriginal land do you need an entry permit, and where and when do you have to apply for it. * In which places on Aboriginal land do you need a camping permit, and where and when do you have to apply for it. * The new rules about camping in national parks, and how to get around them by perfectly legal FREE camping. * Fishing, yabbying and mud crabbing rules in full detail - size limits, bag limits, no-take species, closed seasons, restricted places, special rules for fishing in the waters of the Great Barrier Reef Marine Park, which reaches right to the shore. I'm planning a trip up there this dry season with a mate [towing his camper] and am amazed at the info in your guide. Best I have ever read and thanks for all your hard work. Am just returning from the top and am in Lightning Ridge on my way back to Melbourne. Just a note to say how much I appreciated the Travel Guide on my trip. Thanks again Katrin; your guide is so comprehensive; I don't know how you did it. The destination guide is a great read, full of information, well done on a great effort. * What are all the good four wheel drive tracks that you should not miss? * Where are the best spots for fishing, yabbying, mud crabbing? * Where are the best swimming holes for a cool dip? * Where are the best places for bushwalks? * Where can you see the famous carnivorous pitcher plants? * What are the best places to spot palm cockatoos, cuscus and other birds and animals unique to Cape York and Papua New Guinea (not seen anywhere else in Australia)? A question that I do get - why buy an ebook? Read the main reason in more detail here! (opens in a new window so you keep this page open). 1) You get it instantly. No need to go to the shop or wait for the order to arrive at your house - plus no shipping costs. Pay and start reading straight away! 2) You can use the links - incredibly handy to be taken to the website of a tourist attraction, accommodation, tour company etc - where you find even more information about the place. 3) LAST BUT NOT LEAST! You get much more updated detail in the guide! Ebooks are much easier to update and can therefore have much more detail than 'normal' books. That's particularly important when it is a travel guide! You can have all the prices, phone numbers, opening hours etc and have them updated every year - never happens with 'normal' book guides! Read about the disadvantages and the advantage number three in more detail (opens in a new window so you keep this page open). * Full info for the best planning including FREE camping spots (the first FREE night has paid for the guide!). * Full info for the best preparation including contact details to national park rangers, indigenous councils, remote roadhouses and cattle stations. * Full info for all you need on your trip including contact details and opening hours to your closest doctor, hospital, car mechanic, RACQ, grocery shop and bottle shop. There are not that many! * Full info on how to stay safe including remoteness, snake and spider bites, and how to safely cross creeks and rivers. * Full info on how to stay legal including how to always know whether you are on the land with alcohol bans or restrictions. * All the best spots for the best activities including spotting that cuscus or palm cockatoo you have never seen even if you are an Aussie. Just imagine how many hours you'd spend to get that info together - and there are many things that you would still NOT get - the ones that require local knowledge. Your trip will cost you thousands of dollars. Once you are on the road, you realise just how little money AU $29 is - you pay it for your first camping night, you pay more if you are a family. Fuel is more expensive than at home, food is more expensive than at home, everything is expensive in remote places. Any tips that help you cut those costs are invaluable both during your planning and during your trip. AU $29 is an incredibly cheap way to get the locals' tips to ensure you made the most out of your big dollars you will pay for the trip! Also note that the price is in Aussie dollars. Most often when you buy on the internet the price is in US dollars, which makes it a lot more expensive than it looks! Twenty nine Aussie dollars equals only 21 US dollars. Thanks for the book, it is the best and most comprehensive I have come across. you just can't beat local knowledge. Your guide is GREAT value for money - especially since you allow previous purchasers to update as well!!! The information I had been receiving from your emails were handy and your book that I downloaded was just so informative. Worth every cent of the $25-$30. Recommend no-one should go without it. Here is where you can buy the guide. Click on the icon below and you will be taken to Pay Pal, where you can simply and securely pay for the book (haven't got Pay Pal? Scroll down). Right after your payment you will receive an automatic purchase confirmation email which has the link where you can download the guide into your computer, where you can read it on the screen as well as print it out to get a paper copy - all within minutes!! I do NOT believe that you will not like the guide! But, in the unlikely event that you would be disappointed with it, let me know and I refund your money! In case you get any problems with anything in the process contact me and I will give you a hand.. The latest - the 2018 edition of the Destination Guide came out in the early hours of Saturday 13. January 2018. Like every year before, the Guide has again been reviewed, improved and updated on every detail. In case you get any problems with anything in the process contact me and I will give you a hand. The latest - the 2017 edition of the Destination Guide came out on Saturday 7. January 2017 (you now get the new edition when you buy through this page). Like every year before, the Guide has again been reviewed, improved and updated on every detail (and if you look lower down on the previous years additions - all the older improvements are of course still there). * When To Go chapter was added paragraphs about when does each track open for the season, as well as the local school holidays. * The Do You Need Cash Chapter - the EFPTOS facilities map was added the information of banks (north of Cooktown there are less than 5! ), post offices (= Commonwealth), and also ATMs (as up here EFPTOS does most often not mean that you can get cash out). * The swim spots chapter was added the swimming opportunities in towns and camping grounds - it's hot here - and ocean is not a place to swim! * If you need to rent your vehicle/van - what companies allow you to do the Old Telegraph Track, and all the other fun tracks? The last two subjects are the first that I am planning to turn into separate booklets during this, 2017, Wet Season (hoping to get them out in February - March). There is no need to wait until then with the purchase of the full guide, as the conditions of getting them will not be affected by when you bought the full guide. * Plus all the invaluable information that was in the Guide ever before, has been updated, improved, and added to! The super fresh 2016 version of the Destination Guide came out on Saturday 9. January 2016 (you now get the new version when you buy through this page). * New tracks, new places - Kondiparinga, Fairview/Palmerville, and other tracks; also Turtle Camp, Stones Crossing, Crab Island; tracks in the NPA, and the Jackey Jackey and Escape River area; and many others were reviewed and added info. * Alcohol restrictions reviewed, national park openings updated, events 2016 updated, maps added and updated, and much, much more. * Is there LP Gas? * Where do you actually have internet reception? * All emergency numbers now in the beginning of the book, including local police stations and hospitals; where to ring for vehicle recovery, flood and cyclone emergencies, and Royal Flying Doctors' Service. * Vehicle spares, accessories and tools to bring - reviewed by Mark O'Hagan - the Old Telegraph Track recovery guy. * The five most important recovery gear to bring - in the order of importance - by Mark O'Hagan - the Old Telegraph Track recovery guy. The version you get now was launched in January 2015, after the guide was again updated, reviewed, improved, cleaned up from info no longer relevant, and added lots of new information. UPDATE April 2015 - all the prices (accommodation, any extra trips and tours, museums, attractions, boat trips etc, etc, etc...) were all freshly updated one by one in April 2015 and will apply for the whole 2015 season - you can trust you have the correct price! * New tracks, new places - Falls Track, Skardon River, Old Coach Road, Albany Island, Restoration Island, and many, many more! * The peninsula's best swimming holes, now with a map. * Others taken down, that are no longer free due to the latest changes of rules on some Native Title lands. * Alcohol restrictions updated, some more detailed than before. * National Parks camping updated with information on where to book once you're closer to the park - they have made it easier by providing phones, agents, and touch screen facilities. * National Parks Wet Season closing times - the re-opening time for the Dry season is different in every park - find out what park may still be closed in May, June, some even July. * 4WD tracks that open later were also added the info about when they usually open, and the note that you should not plan one into an early season trip. * RACQ - what does it actually give to you for your Cape York trip, considering the fact that the distances and conditions are different from most other places. After I talked to all the local RACQ mechanic shops, read what they do/not and decide whether it is worth for you. * And finally, with so many people writing to me that they did not see one single croc on their trip, I decided the info was needed - why do locals see lots of crocodiles while most travellers do not - you have to know where to look, when to look, how to look! * And the same info went in for some other north Queensland icons like cassowaries, tree kangaroos, and amethystine python - Australia's largest snake. * And the same info also went in for our Cape York icons - palm cockatoo, eclectus parrot, cuscus and green tree python. Right after your payment you will receive an automatic purchase confirmation email which has the link where you can download the guide into your computer, where you can read it on the screen as well as print it out to get a paper copy - all within minutes! This book has been gradually growing since I started the website in 2009. Each year it is updated on all detail, plus always added new information - to make sure that for each and every year, it improves !!! If you haven't got Pay Pal, you will still be taken to the same page, and on that page you have the option to sign up with Pay Pal. And you should do that anyway. Pay Pal is the safest way to pay, where nobody will see your bank account details. When you pay with a bank card, your card details are forwarded. When you pay with Pay Pal, all you use is an email address that is connected to your Pay Pal account. It is the safest way to pay, and a website that does not offer PayPal payments is nowadays unusual (and considered suspicious). Please note that it is important to read the information on this page before you order. You can now buy the guide as a present! There is now a brand new Trailer Guide which is a supplement to the Destination Guide, and found inside it. All for the very cheap price of $7 !! Completely unique information found nowhere else. 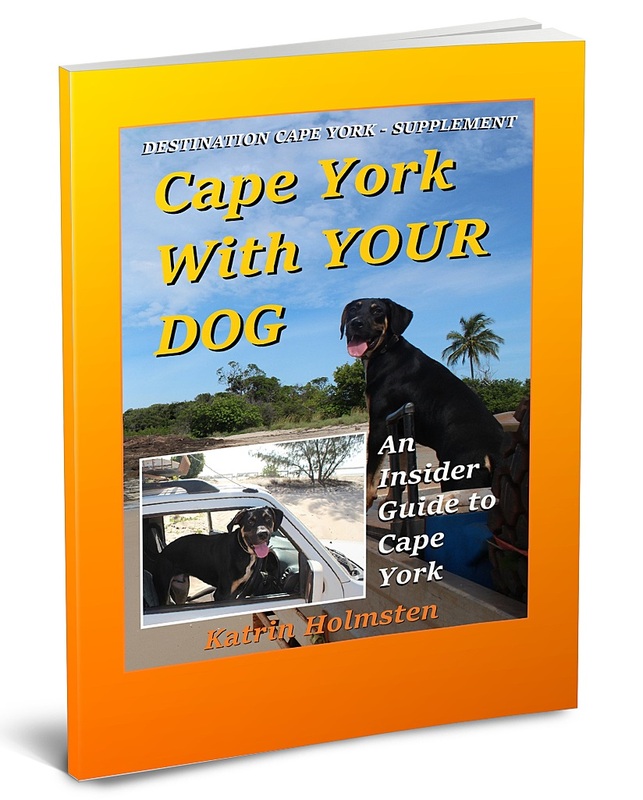 Put together inside the Cape, based on first hand experiences, local knowledge and direct research (not from other books or web information - just like the full Destination Guide itself!). There is now a brand new Caravan Guide which is a supplement to the Destination Guide, and found inside it. * What places actually have powered sites – the majority do not up the Cape! There is now a brand new Dog Guide which is a supplement to the Destination Guide, and found inside it. * Which national parks are you actually allowed to take your dog/s through, and what about camping? * What about dogs on the FREE camping sites? * What 4WD tracks are they/not allowed through! * Which are the places that you are going to miss out completely if you travel with dogs? * and what about Thursday Island and other Torres Strait Islands? As the Doggie Guide was updated again in January 2019 - amongst all the other things - information was added about the extra vaccinations that you should consider - against some fatal dog diseases that thrive extra well in the tropics and Cape York.